Product prices and availability are accurate as of 2019-04-21 21:27:29 UTC and are subject to change. Any price and availability information displayed on http://www.amazon.com/ at the time of purchase will apply to the purchase of this product. Retail value is almost $25 or more. 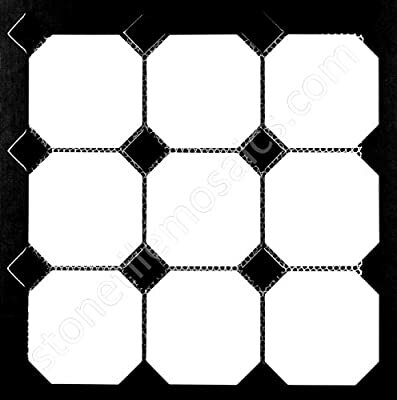 4" Octagon Matte White with Glossy Black Dots Mosaic on a mesh netting is easy to install, clean and maintain. 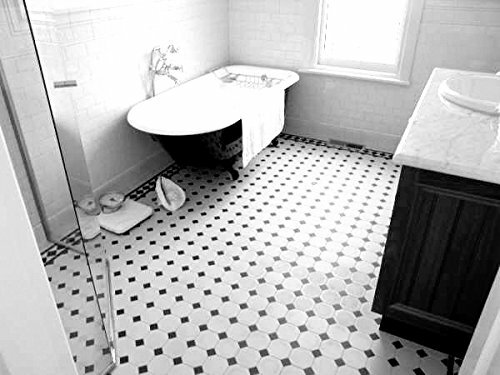 If you want to have a retro old design look on your bathroom this is the tile you should buy. We maintain great value and high quality on our products. For any reason, if you don't like the mosaics, please let us know so we can arrange a return process at your convenience. Resistance to scratch, great for bathroom floors, bathroom walls, showers, kitchen backsplash, swimming pools, interior and exterior use. 4" Octagon Matte White with Glossy Black Dots Mosaic Tile Color&Finish : Matte White with Glossy Black Dots Field Size: 12 inch x 12 inch Format: Mesh Mounted-Easy to install: Thickness: 1/4"